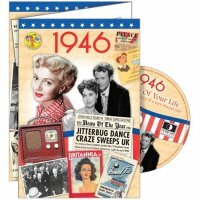 1946 The Time of Your Life Greetings Card and DVD of the year's news and events. Not only a GiftCard, not only a DVD, but a whole hour of memories of a very special time in what is probably the most universal and appreciated gift around. Each DVD Giftcard features an exclusively commissioned 60 minute documentary compiled from news archives of the prestigious British Pathe News focusing on British and World events and comes presented in a quality 3-part gate-fold GiftCard. 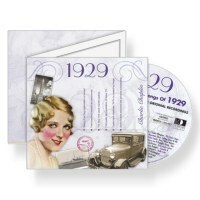 It all adds up to a very entertaining package; the ideal card & gift for anyone with fond memories of 1946. GiftCard, DVD, and white envelope, are all sent in a protective outer. Total running time approx 60 minutes. Dispatched the same day or next working day. Order this item before 1pm for same day dispatch (Mon-Fri).